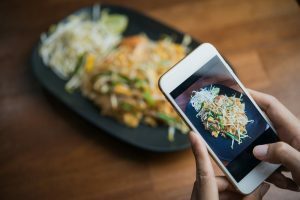 Social media for restaurants: it’s vital for sustainable business growth no matter which way you cut it. Many businesses don’t have the best strategy for executing this important task, and it’s severely limiting their growth potential. Or even worse – they barely have a presence at all. The good news is, you can avoid most of the common pitfalls many restaurants in New Mexico don’t even realize they’re falling into. According to digital marketing expert T. Maxwell, many restaurants get social media completely wrong. Most of these mistakes are things businesses probably think are great ideas like using lots of hashtags (a big no-no for Facebook) or posting their social media feed on their website. Here’s what you can do right now to improve your social media presence and – hopefully – grow your business, too. When readers click over to your website from Facebook or Twitter, what do they see? Is it easy to navigate your homepage? People browse different platforms for different reasons. Linking your Twitter, Facebook, and Instagram feeds together is a big mistake. Put special thought into your posts for each platform. You may want to consider hiring a marketing agency to handle this job because it can become pretty burdensome. Plus, it requires knowledge and mindfulness. Not to mention, seeing the same posts on multiple platforms can quickly get annoying and send your audience running for the unfollow button. It’s also a bad idea to integrate your various social media feeds with your website’s homepage. This takes up valuable space and functions a lot like clutter. You run a website in New Mexico. Your social media presence should reflect this. What good does it do you or our economy if your posts go viral nationally or internationally? Sure, it might bring in some extra business for a few days, but that’s not sustainable. Instead, target local NM residents with your posts. Include locally relevant hashtags about events or specials. Use local keywords with cities or even neighborhoods for your blogs, posts, and pages. 100 local followers are much more valuable than 1,000 international followers. This method allows you to form a direct and personal relationship while avoiding the social media algorithm filters. Schedule an email campaign to go out on Friday at 4 pm as people are scrolling their phones looking for something to do after work. Include your weekend specials or events. For more information on Creating a Social Media Marketing Plan for Your Restaurant click here. Contact the New Mexico Restaurant Association to Learn More – The New Mexico Restaurant Association (NMRA) is committed to helping you run a thriving business in our great state. Contact us today to learn about membership opportunities and how we can help you.